NUMA architectures logically follow in scaling from symmetric multiprocessing (SMP) architectures. They were developed commercially during the 1990s by Unisys, Convex Computer (later Hewlett-Packard), Honeywell Information Systems Italy (HISI) (later Groupe Bull), Silicon Graphics (later Silicon Graphics International), Sequent Computer Systems (later IBM), Data General (later EMC), and Digital (later Compaq, then HP, now HPE). Techniques developed by these companies later featured in a variety of Unix-like operating systems, and to an extent in Windows NT. 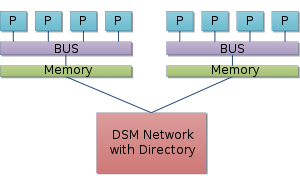 One possible architecture of a NUMA system. The processors connect to the bus or crossbar by connections of varying thickness/number. This shows that different CPUs have different access priorities to memory based on their relative location. Topology of a ccNUMA Bulldozer server extracted using hwloc's lstopo tool. ^ a b Nakul Manchanda; Karan Anand (2010-05-04). "Non-Uniform Memory Access (NUMA)" (PDF). New York University. Retrieved 2014-01-27. ^ Sergey Blagodurov; Sergey Zhuravlev; Mohammad Dashti; Alexandra Fedorov (2011-05-02). "A Case for NUMA-aware Contention Management on Multicore Systems" (PDF). Simon Fraser University. Retrieved 2014-01-27. ^ a b Zoltan Majo; Thomas R. Gross (2011). "Memory System Performance in a NUMA Multicore Multiprocessor" (PDF). ACM. Retrieved 2014-01-27. ^ "Intel Dual-Channel DDR Memory Architecture White Paper" (PDF) (Rev. 1.0 ed.). Infineon Technologies North America and Kingston Technology. September 2003. Archived from the original (PDF, 1021 KB) on 2011-09-29. Retrieved 2007-09-06. ^ "ccNUMA: Cache Coherent Non-Uniform Memory Access". slideshare.net. 2014. Retrieved 2014-01-27. ^ Per Stenstromt; Truman Joe; Anoop Gupta (2002). "Comparative Performance Evaluation of Cache-Coherent NUMA and COMA Architectures" (PDF). ACM. Retrieved 2014-01-27. ^ David B. Gustavson (September 1991). "The Scalable Coherent Interface and Related Standards Projects" (PDF). SLAC Publication 5656. Stanford Linear Accelerator Center. Retrieved January 27, 2014. ^ "The NumaChip enables cache coherent low cost shared memory". Numascale.com. Retrieved 2014-01-27. ^ "Linux Scalability Effort: NUMA Group Homepage". sourceforge.net. 2002-11-20. Retrieved 2014-02-06. ^ "Linux kernel 3.8, Section 1.8. Automatic NUMA balancing". kernelnewbies.org. 2013-02-08. Retrieved 2014-02-06. ^ Jonathan Corbet (2012-11-14). "NUMA in a hurry". LWN.net. Retrieved 2014-02-06. ^ "Linux kernel 3.13, Section 1.6. Improved performance in NUMA systems". kernelnewbies.org. 2014-01-19. Retrieved 2014-02-06. ^ "Linux kernel documentation: Documentation/sysctl/kernel.txt". kernel.org. Retrieved 2014-02-06. ^ Jonathan Corbet (2013-10-01). "NUMA scheduling progress". LWN.net. Retrieved 2014-02-06. ^ "FreeBSD 11.0-RELEASE Release Notes". freebsd.org. 2016-09-22. This page was last edited on 1 January 2019, at 10:58 (UTC).